Available in 250W and 375W models these high Efficiency DC/DC converters are environmentally sealed to IP65. 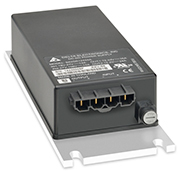 They provides a precise regulated output of 12.0 or 24.0 volts for computer terminals and communication equipment. Also capable of providing 13.5 or 28.0 volts for driving lamps and charging auxiliary batteries. Configured specifically for electric vehicles. 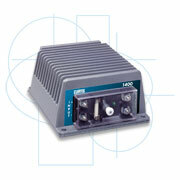 Designed to provide a reduced voltage supply to power auxiliary electrical systems. Curtis Model 1415 is a low power, isolated DC/DC converter intended to provide power to smart devices and other low power components. Curtis Model 1415 is designed to provide power to smart devices via a USB port or other low power components/systems in golf cars, forklift trucks, floor cleaners, aerial work platforms and ground support equipment. 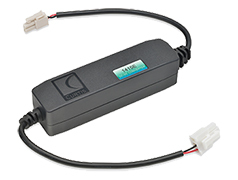 Curtis Model 1416 is designed to be used on 24 and 36VDC battery-powered vehicles to provide reliable and regulated power to 24VDC accessories. Model 1416 utilizes a compact and sleek design to easily be integrated into a vehicle design, thereby eliminating the costly and inefficient practice of battery tapping. Curtis Model 1420 is a high efficiency DC/DC converter designed to provide a reliable and regulated low voltage output for battery-powered vehicle accessories. Curtis Model 1420 is designed to be used in battery-powered vehicles including golf cars, forklift trucks, floor cleaners, aerial work platforms and ground support equipment.